If you want a watch that offers that perfect balance between luxury and rugged outdoors ‘Man of Action’ appeal, you don’t need to look further than the TAG Heuer brand. With over 150 years of Swiss watchmaking excellence and impeccable craftsmanship under its belt, TAG Heuer is one brand that has become almost synonymous with high quality outdoor rugged watches which look just as awesome in a corporate boardroom as scaling mountain ranges. This dual appeal makes TAG Heuer, among the many other Swiss luxury watch labels on the market today, stand out from the crowd. Sure, other brands might put out luxury sports watch with the obligatory timer, dual dials, and other features you’d expect from a sporty luxury watch. But there would be something missing. Maybe it is ‘believability’ or technology or just raw experience in manufacturing high quality luxury sports watches. Some TAG fans would say that what is missing from these other labels’ sports luxury watches is the brand that truly epitomizes an active yet luxurious lifestyle TAG Heuer. True to its pedigree and storied brand, the TAG Heuer Men’s Aquaracer Stainless Steel Watch makes the Aquaracer lives up to the TAG name. You can dive up to 1000 feet with this watch and not have to worry about your watch stopping or forming moisture on its face. This time piece also has a scratch resistant sapphire piece. As you can probably tell, TAG doesn’t hold back when it comes to quality and features. In terms of design, it isn’t an over the top TAG design and this should suit many people looking for a great luxury watch to wear in an indoor or corporate setting just fine. 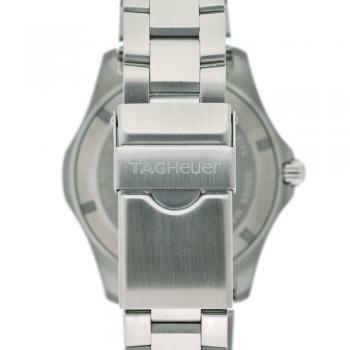 In fact, compared to other TAG watches, the TAG Heuer Men’s Aquaracer Stainless Steel Watch actually comes in on the tame end of the design excitement end. One can say that it exudes a certain cool confidence. It can deliver all the rugged outdoor performance you’d expect from a TAG Heuer watch but prefers to stay in the background and remain relatively understated. While TAG watches are mostly known for their bravado and ‘take charge’ mystique, the TAG Heuer Men’s Aquaracer has a cool detachment to it. It doesn’t look too eager to jump into the outdoors or some action setting but you know that it has the mechanism and guts to take care of business. This is precisely what makes this watch so appealing. It doesn’t hit you over the head with its power. It merely stands back and looks cool. Gotta respect that. What separates a truly ‘luxury’ or high end watch from other types of watches? The movement, of course. Automatic movements are not cheap to create. Also, they aren’t built or undertaken lightly. When a watch maker decides to use an automatic movement system, it has to step up to the plate and knock the ball out of the park in terms of quality. TAG Heuer has over 150 years of doing precisely this. A TAG watch won’t be a TAG watch without some features that shows the time piece can handle whatever the rugged outdoor throws its way. From its sapphire-based scratch resistance to its ability to be used underwater for up 100 feet, you know the TAG Heuer Men’s Aquaracer exhibits all the classic TAG Heuer quality standards. 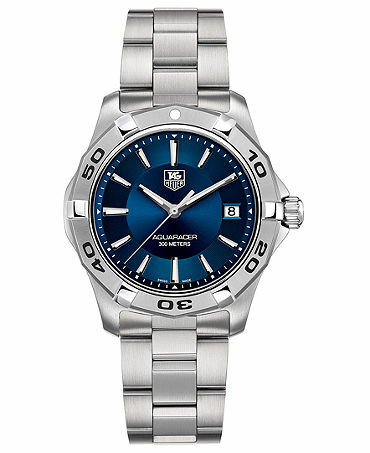 If you are looking for a great indoor TAG watch, the TAG Heuer Men’s Aquaracer is a safe bet. It is not loud. It doesn’t hit people over the head. Still, despite its cool demeanor, it still manages to project all the best impressions you’d expect from the TAG Heuer brand. Considering its reasonable price (relatively), the TAG Heuer Men’s Aquaracer is a great choice for a person looking to get into sports watches.